Heat gas or charcoal grill. Place sausages on grill over medium heat. Cover grill; cook about 25 minutes, turning occasionally, until no longer pink in center. Meanwhile, in large bowl, toss all peperonata ingredients except olives; place in grill basket (grill “wok”). Place basket on grill with sausages; cook 5 to 8 minutes, shaking basket occasionally to turn vegetables, until bell peppers and onion are crisp-tender. Stir olives into peperonata. 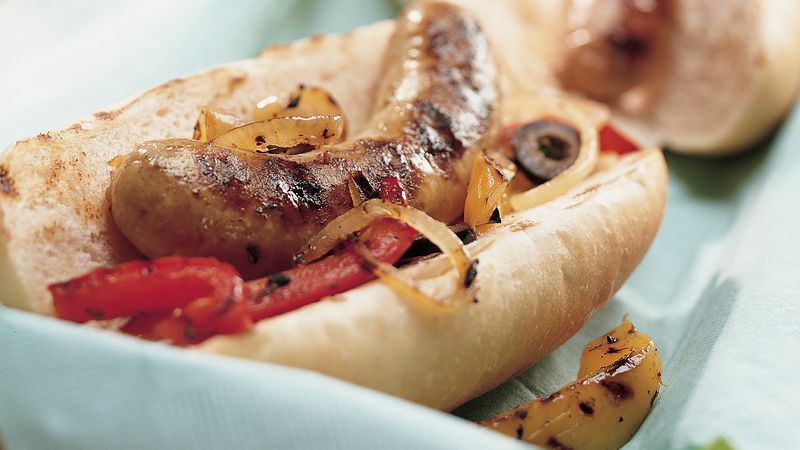 Serve sausages on buns with peperonata. If you have leftover peperonata, serve it on grilled steak sandwiches or fajitas.